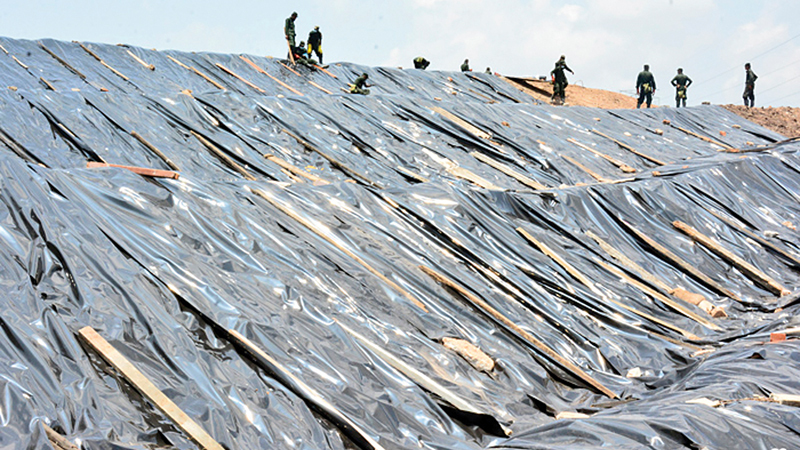 Army engineers are in the process of covering the remainder of the garbage dump at Meethotamulla with polythene to ensure the safety of those still living nearby. This is a containment technology that forms a barrier between the contaminated area and the surface, thereby shielding humans and the environment from the harmful effects of its contents and perhaps limiting the migration of the contents. According to the Army, another segment of troops of the Sri Lanka Engineers (SLE) and the Corps of Engineer Services (CES), following guidelines, specified by the Commander of the Army, are liaising with Major General Dananjith Karunaratne, Chief Field Engineer of the Army, and are repairing and re-painting the affected Meethotamulla Sri Rahula Vidyalaya buildings. Engineer troops offering their technical expertise are meanwhile, measuring water levels every hour in the garbage pile to indexing geological changes or developments underneath as advised by geologists. Meanwhile, clearing of debris and search for those missing continue unabated.